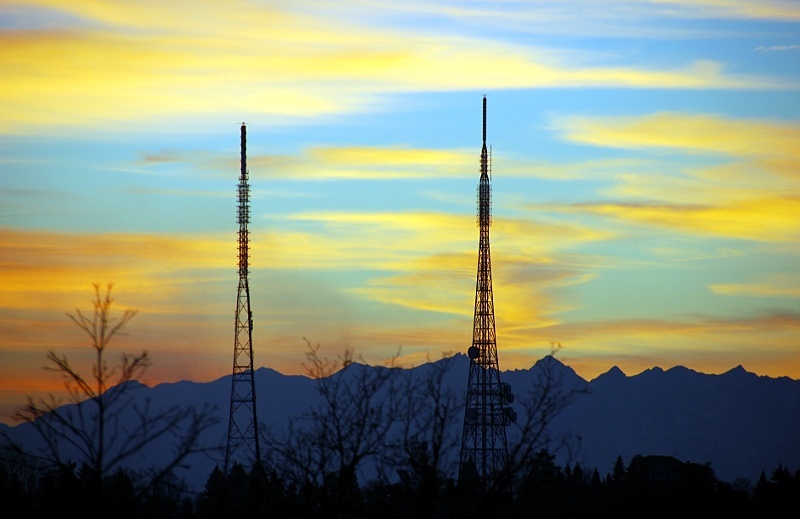 Late evening, exiting as last visitors of the Infini.To Astronomical Park, I discovered this contrast between the Eremo technological antenna towers and the Alps behind them in their dusk colors. I just played a little bit with the colors to get a more realistic contrast feeling between the clouds (still in the sun) and the ground (already in the dark). I think that the contrast between the “vertical modern” and the “horizontal natural” subjects is an interesting comparison. This entry was posted in Color, Landscape and tagged Alps, antenna, Astronomical Park, autumn, backlit, cloud, clouds, color, colorful, colors, contrast, cover, dark, dusk, environment, eremo, evening, fall, golden, horizon, horizons, idyllic, natural, nature, outdoor, outside, panorama, park, ray, red, scenery, silhouette, sky, sun, sunset, technological, tower, vertical. Bookmark the permalink. I know these are just TV and communications towers but perhaps because of their sheer size, they feel scary to me. They certainly have an effective vertical thrust against the horizontal strata of clouds. The towers and foreground branches make a great veil in front of those incredible alps. The blue luminous glow of those mountains is particularly beautiful. That’s a stunning image Max ! The wavy cloud is perfectly positioned behind the right hand tower and perfectly contrasts the rigid geometric form. Very nice work ! fantastica! nei colori nella saturazione e nel soggetto!! This is interesting indeed, I agree. I love the colors!